Go In store and buy anything even a 6p reusable carrier bag and get a voucher for 20% off throughout the store it says use this voucher every time you shop!!! It has a few exclusions. So basically books and stationery. why has it been expired? Thanks I'm a bit new to this posting lark !! Use the 20% on a Sony Prs650 touch e book reader priced @ £29.99 ..............it would make it just £23.99. If it was 50% off it would make it standard price. Prices in WH Smiths are disgusting. If it was 50% off it would make it standard price. Prices in WH Smiths … If it was 50% off it would make it standard price. Prices in WH Smiths are disgusting. When I went in it had loads of sale stuff and it was much cheaper than any other online book store for all the stuff I wanted I hope it helps somebody !! I must admit I did buy a super book last week "The car book" for £2.99. This book is £16 in Amazon. Oh dear. Not a good sign. Used to love WHSmith when they sold C64 budget games. Not bought much from there since though!! 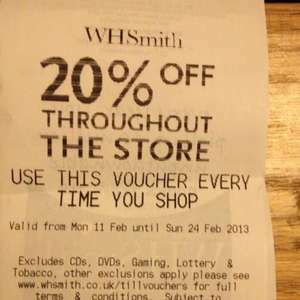 WHSmith pretty much has till vouchers for 10-20% off 100% of the time, it is not a deal because it is a on all the time and because everything in that store is 20% or more overpriced anyway. Oh dear. Not a good sign. Used to love WHSmith when they sold C64 budget … Oh dear. Not a good sign. Used to love WHSmith when they sold C64 budget games. Not bought much from there since though!! Use the 20% on a Sony Prs650 touch e book reader priced @ £29.99 … Use the 20% on a Sony Prs650 touch e book reader priced @ £29.99 ..............it would make it just £23.99. When I went in it had loads of sale stuff and it was much cheaper than … When I went in it had loads of sale stuff and it was much cheaper than any other online book store for all the stuff I wanted I hope it helps somebody !! Agreed. Lots of sale stuff is reasonably priced and 20% off is a real bonus. You can't get 20% off magazines anywhere else, unless you subscribe. Lots of confectionery is same price as supermarkets, so 20% if that's your thing. They have lots of offers on books (e.g. buy one get one for a pound) which are not dissimilar to online prices, and again 20% off makes them cheaper (e.g. £7.99 plus £1 for two books, total of £9.00, less 20% £7.20. Amazon UK chart paperbacks are typically £3.85 each, so two of them £7.70). I bought the Christmas Virus novel for £3 in Edinburgh Gyle branch, and it's £9.99 on Amazon (amazon.co.uk/Chr…1_1?s=books&ie=UTF8&qid=1359583754&sr=1-1) so it's not always true that WH Smith are more expensive (though I do accept that they often are). So, thanks to OP for posting this. It IS a good find and I've added heat. 20% off stuff that's >20% more expensive than everywhere else.. They don't sell Adult Magazines any more, oh well. What Hi-Fi, Home Cinema Choice and T3? WH Smith posted profits of more than £100m in 2012. admin not impossible but highly unlikely. also had a good christmas one of best profits in xmas 2012 period. Not bad with so many items also on 3 for 2. I've just bought 3 Pukka pads which worked out at £2.40 with both offers. That's great news don't want to see any body loose their jobs !! Not bad with so many items also on 3 for 2. I've just bought 3 Pukka pads … Not bad with so many items also on 3 for 2. I've just bought 3 Pukka pads which worked out at £2.40 with both offers. Going for another look today ! !